Le Mans 2010 Post Qualifying Wrap. 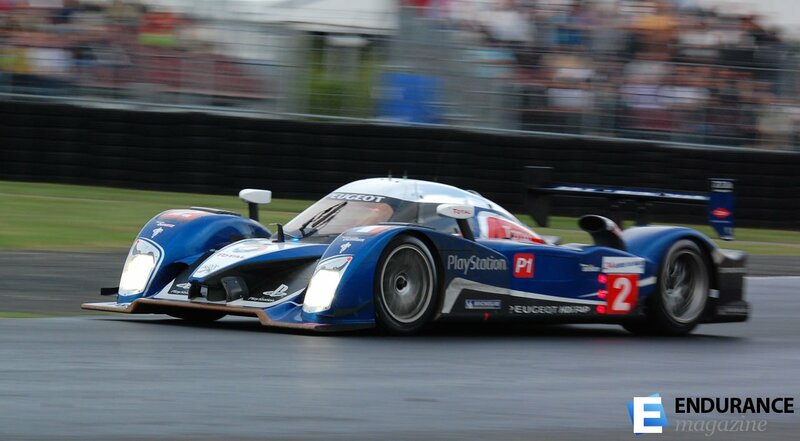 #2 Peugeot of Sarrazin during qualifying session02. - Image courtesy Geoffroy Barre. Being that time of the year again, proceedings for the 2010 running of the legendary 24 Hours of Le Mans (the 78th rendition of the event) are well underway. With qualifying now completed we see some familiar trends emerging. Namely the continued dominance of Peugeot and Ferrari camps in their respective categories. Despite the presence of strong works supported entries in all classes, the appearance of new challengers in HPD and BMW-powered entries in both LMP2 and GT2 has caught many by surprise. The first qualifying session of the week saw Peugeot surge to an early lead on the timesheets. 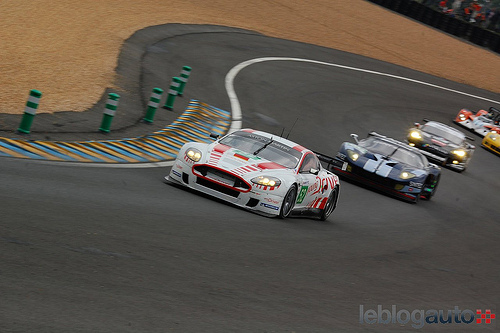 With both the Oreca and factory entries securing the top four positions on provisional listings. Most onlookers were eagerly awaiting some (or any) form of response in pace from Audi. The Ingolstadt-based squad managed to breach the margin to the leading #3 Peugeot to 3.867 by the end of the first session. With Mike Rockenfeller setting a time of 3:23.578 to place the #9 car in fifth position. Kristensen on board the#7 Audi during qualifying. - Image courtesy Geoffroy Barre. 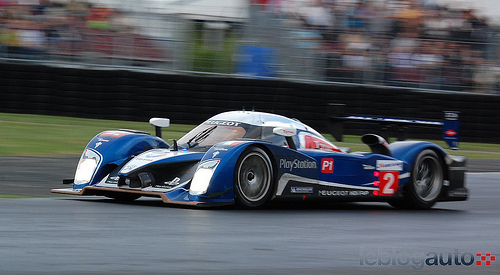 Peugeot’s dominance would continue during the second qualifying session. Bourdais’ early time of 3:19.711 would weather the ensuing storm of pace throughout the session, Peugeots #2 and 3 securing second and third, respectively. 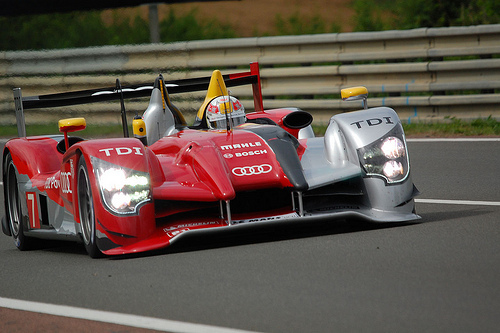 Audi’s #9 squad again remained the highest placed contender for the team, with on-loan Porsche factory driver Romain Dumas managing a 3:21.981. 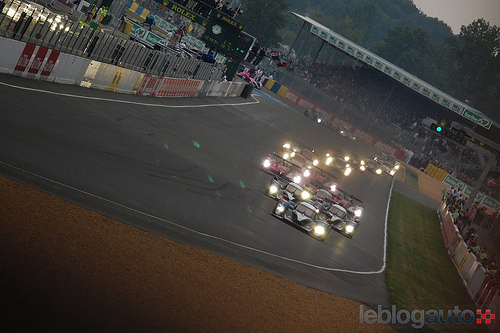 Decreasing the margin to the leading #3 Peugeot to a mere 1.481sec to secure fifth position on the grid. Cars #7/8 will start from sixth and seventh position on Sunday afternoon. Forever the dark horse, AMR would complete both qualifying sessions without difficulties. Stefan Mücke setting a time of 3:26.680 to secure eighth position for the #007 entry, relegating the #009 sister car of Turner/Hancock/Barazi to ninth starting position by a margin of .067sec. 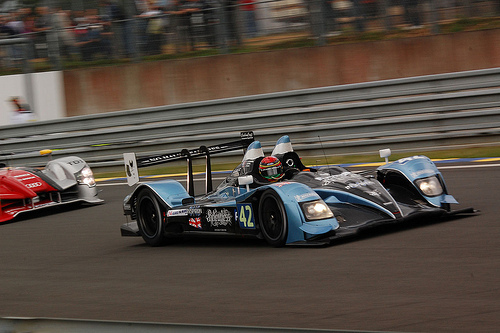 Danny Watts takes the #42 Strakka HPD ARX01c to pole. - Image courtesy Geoffroy Barre. Having set and maintained pace early during practice, HPD-powered entries continued to dominate both LMP2 qualifying sessions. Strakka’s Danny Watts would seize pole for the team with a time of 3:36.168, narrowly edging out their trans-Atlantic cousins, Highcroft by a margin of .466sec. Reigning Le Mans Series LMP2 champions Quifel-ASM snared third position with Olivier Pla’s lap of 3:41.968, besting the OAK Racing outfit by a minimal margin. Affirming what had long been suspected, the ACO has confirmed the removal of the GT1 category from future competition in both the 24 Hour, and Le Mans Series, during a press conference regarding the much hyped future regulations earlier today. Combining a selection of seasoned Le Mans and LMS veterans, and current GT1 World Championship entries, the GT1 category looks set to deliver a fitting send off for the class of high-powered supercar machinery. Stamping their presence early, YoungDriver AMR would combine successful showings in sessions 1/2 to achieve class pole, marginally outpacing the #70 Ford GT of recent Spa 1000km winners, Marc VDS Racing. Despite dramas during practice the #60 Matech Ford GT entry of Grosjean/Mutsch/Hirschi would secure third, ahead of both #72/73 entries of past LMS runners, Luc Alphand Adventures. 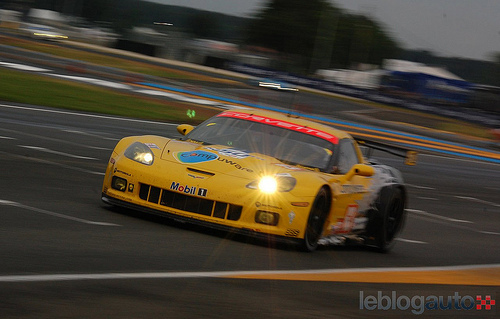 Oliver Gavin takes the #63 Corvette C6R to an initial second position during qualifying. - Image courtesy Geoffroy Barre. With seventeen entries and more than half of which factory supported and equally capable of victory, GT2 is looking set to provide a clash of the marques to be remembered for years to come. In what is becoming a 24H tradition the #82 Risi entry surged to the front of the class early but, in unfortunate turn of events, the team would later be relegated to the rear of the grid. The squad penalised as a result of semantics regarding the legality of aerodynamic components in use during the qualifying session. Risi driver Jaime Melo provided a brief summary of his thoughts on the matter – “It’s where you finish that is important.” Having benefited from the misfortunes of Risi, the #63/64 P&M entries line up in positions one and two, securing an all Corvette front row. Felbermayr-Proton maintained their reputation as the top performing Porsche outfit. The #77 of Lieb/Lietz/Henzler moving to fourth position after Risi’s post-qualifying penalty. The Jeff Koons' designed, BMW Motorsport #79 'art car' entry. - Image courtesy Geoffroy Barre. Having recently conquered the Nürburgring 24 Hour after a five year absence, BMW Motorsport now has a new challenge. After an eleven year Le Mans sabbatical (following the closure of the V12-LMR programme) the Charly Lamm-lead squad returns to La Sarthe with an almost palpable hunger for victory. Having received a balance of performance adjustment upon their arrival to the circuit (enforcing a decrease in air-restrictor size, and the subsequent loss of 10-15HP) the outfit must now alter their race strategy. Despite suffering as a result of the penalty during early sessions, the team managed to greatly improve single lap pace during qualifying. The #78 entry of Müller/Farfus/Alzen taking fifth position. 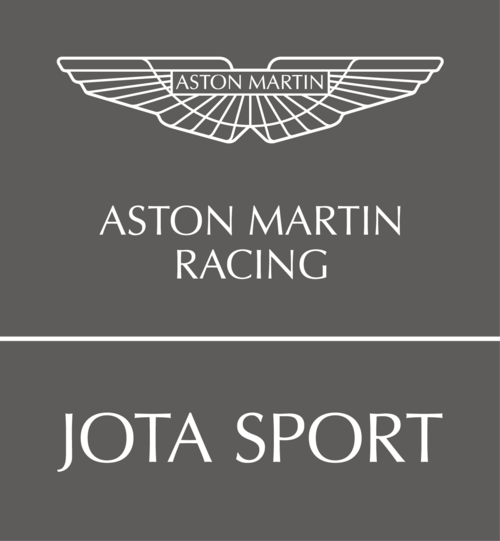 Aston Martin Racing Confirm Multi-year JotaSport Partnership. Aston Martin Racing have confirmed the signing of a multi-year deal with British racing team, JotaSport. Part owned by recently signed AMR Factory driver Sam Hancock, JotaSport has a history of competition in Carrera Cup, European V-Dev, and SPEED series. The signing of the contract sees the Kent-based outfit become an Aston Martin Racing Official Partner Team. JotaSport has outlined their roadmap accordingly. Effective immediately, the team will commence an Aston Martin GT4 programme, competing at both the 2010 Spa and Silverstone 24 hour events. As of 2011, the team will graduate to the Le Mans series (and, all things going to plan, the Le Mans 24 hours) where it will run an AMR V8 Vantage in the highly competitive, manufacturer driven GT2 category. While all details regarding the partnership are yet to be confirmed, the agreement confirms JotaSport’s running of simultaneous GT2/4 programmes throughout 2012. With potential for further expansion to the premier prototype category (pending AMR’s yet-to-be-confirmed position future LMP1 activities). BMW unveils Art Car No.17. BMW Motorsport has today unveiled the latest edition to its family of iconic art liveried cars. 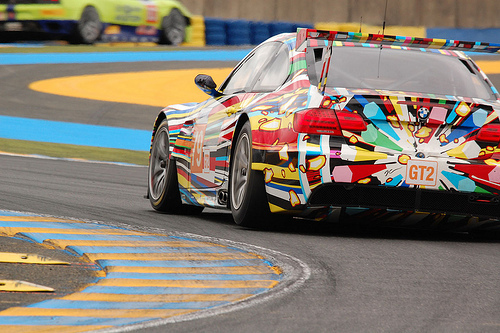 Designed by American artist Geoff Koons, the eye-catching livery marks BMW’s 17th ‘art car’ release, celebrating the manufacturer’s return to competition at the famous Le Mans 24 Hour race later this month. Koons becomes a member of a distinguished group of artists, joining the likes of Lichtenstein, Stella, Calder, and Warhol. All of whom have designed art liveries for the Bavarian marque in the past.